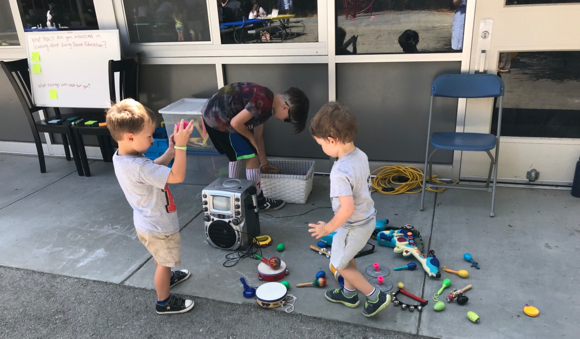 Next month, the Menlo Park City School District is opening its long-planned preschool, offering full and part day programs for children ages 3-5. Jessica Mihaly, Director of the Early Learning Center, hosted a welcome event at Laurel School last weekend for enrolled students and families to meet each other and their new teachers, enjoy some fun activities like face painting, music making, sensory water play, art, and good old fashioned running around and digging in the sand. The Center will open August 24 and currently has 52 enrolled children. Run by MPCSD and housed at Laurel School’s Lower Campus, the ELC is a fee-based preschool program with 25% of spots dedicated to lower income families with free and reduced tuition. It is part of MPCSD’s commitment to improving education opportunities and outcomes across the community. The ELC operates on the principle that young children flourish in environments where play, experimentation and positive interactions are at the core of their everyday experiences and that children have the capacity to persevere with great concentration on challenges that truly engage them and light the fire of their curiosity. Caring and knowledgeable teachers support the development of friendships, foster positive conflict resolution skills, and ensure that children have a sense of belonging and feel safe and valued for their unique gifts. For more information about the ELC, including space available in the afternoon program, please visit https://district.mpcsd.org/earlylearning.